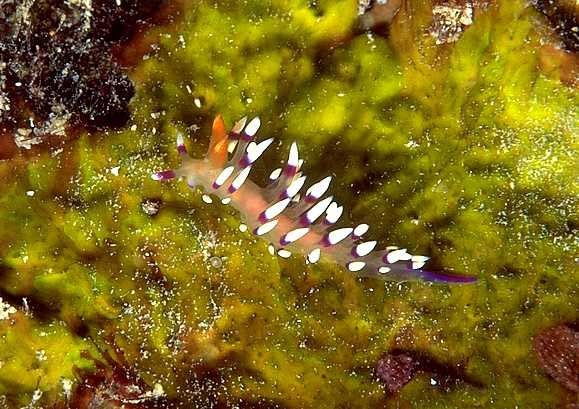 This is a fairly common eolid nudibranch around O`ahu, often found along vertical faces in clear water where there is some surge or current. The cerata of Hawaiian specimens I have photographed are bright white instead of cream as described by Gosliner and Willan. 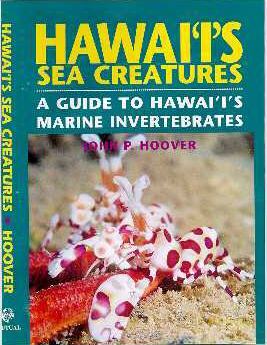 The species has an Indo-Pacific distribution and in Hawai`i, at least, seldom exceeds 1/2 inch in length. The photo was taken at Kahe Point, O`ahu along the hot water outfall. A few of these tiny colorful slugs can almost always be found here if one looks carefully. Depth was about 20 ft.
For some years I carelessly mistook these eolids for the somewhat similar Caloria indica, even erroneously identifying them as such in my book. When I sent Mike Miller this image for the Slug Site he quickly pointed out its true identity. Unhappily, it was too late to correct the book. The two eolids can be easily distinguished from one another by examining the rhinophores. Those of F. exoptata are thick, studded with papillae, and completely orange-red; C. indica's are slender, smooth, and orange-red with a thick white band. There are other color differences as well, and in Hawai`i the two prefer different habitats (C. indica being found in more protected locations, such as Kane`ohe Bay). Both species feed on hydroids.